Happiness is always the emotion that one feels when one hears the word “cake”. Well, this applies to most of us! And I have been obsessed with cake through my entire life. I loved eating cake in my childhood and the taste of the cakes that I ate still lingers in the deep recesses of my memory. But now, I love making cakes for my loved ones. I have a cake recipe to suit all the occasions that dot my life. Plain cakes flavoured with vanilla, chocolate or orange for little Hari’s birthdays, fresh fruit and dried fruit cakes for Ro’s birthdays and other interesting cakes for other events. My regular readers would know all about my tryst with cakes. Christmas is round the corner. Christmas tree, gifts that Santa brings are all good, but the festivities are really not complete without a good fruit cake. 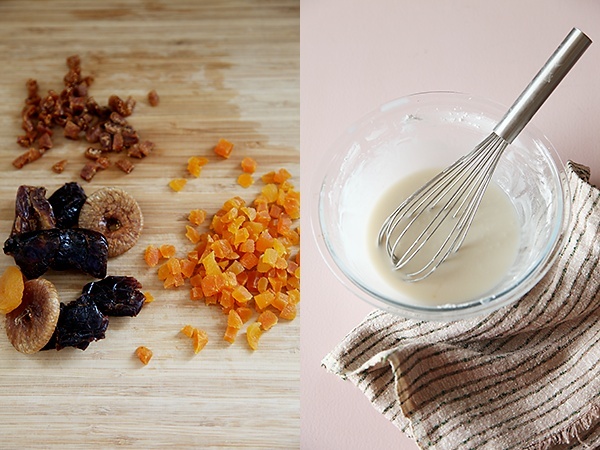 While I have a really popular recipe for a great fruit cake, this time I decided to experiment with a different idea that I had in mind. And it turned out to be fabulous! Full of rich flavours and a super awesome texture to boot, this cake won the hearts of everyone whose palates were touched by its morsel. So, I went on to make 3 batches of this cake. I drizzled this cake with a beautiful vanilla glaze. The first glaze was a bit runny, so the second time I prepared a thicker glaze. The trick is to use as little milk/liquid as is possible for a smooth and nice glaze. 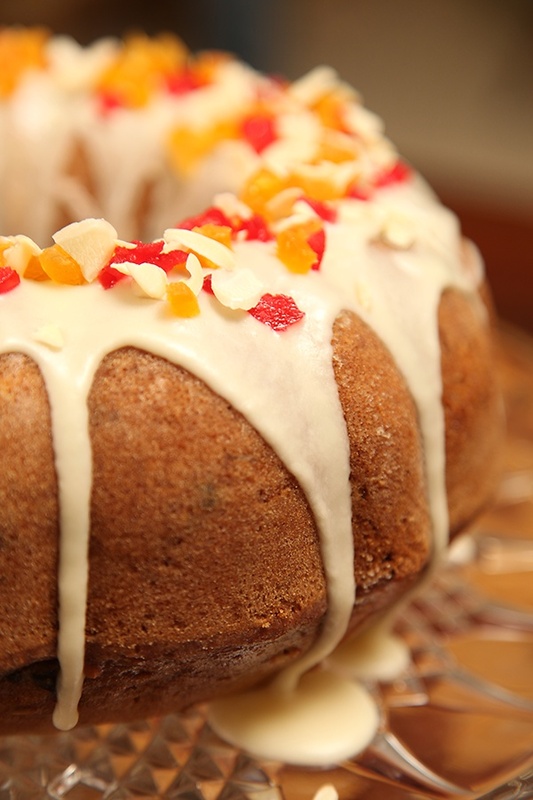 The glaze, if properly executed, lends a beautiful persona to this cake and also gives a nice mouthfeel when eaten. 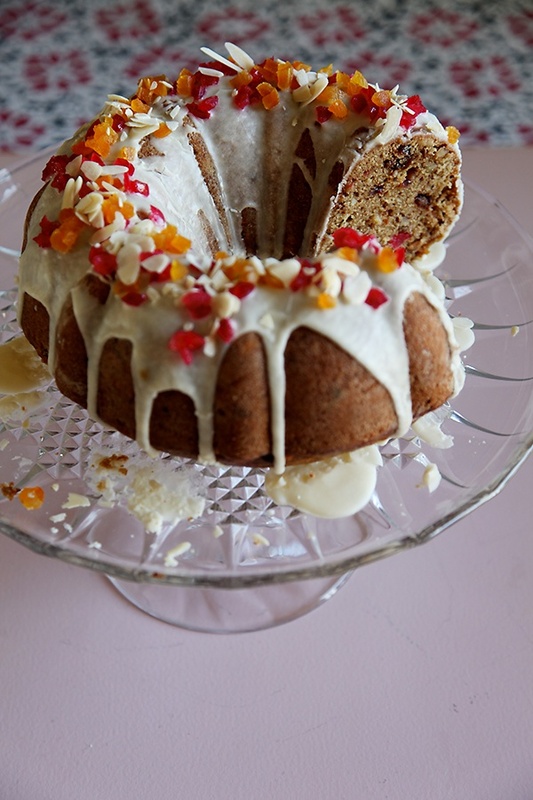 It balances the warm flavour of spices like cinnamon and nutmeg used in the cake. 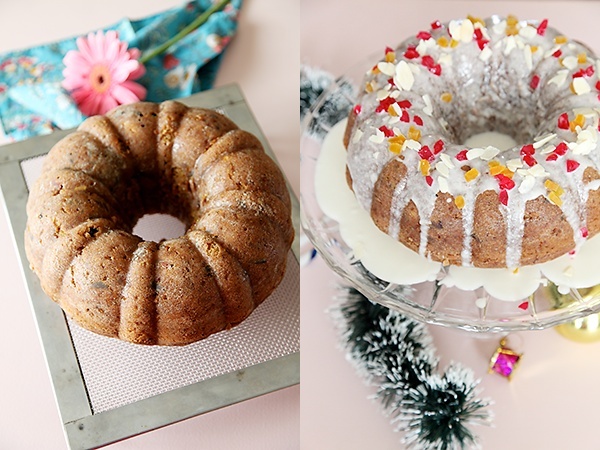 While a festive sponge cake is always welcome, the dense character of a dry fruit cake always lends itself well to an afternoon with your favourite drink on hand. This is the kind of cake that makes one savour the burst of aroma and taste that touch the senses and creates good food memories. You can keep this cake plain or dress it up with the glaze! The choice is completely yours! 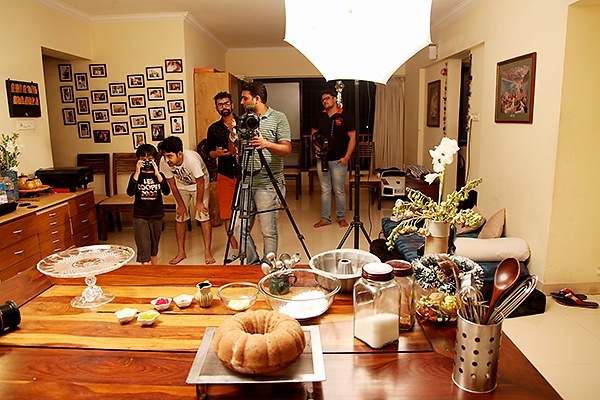 My crew and I had a great time shooting this cake for the Christmas webisode of Divine Taste With Anushruti. And the highlight for me was when Hari joined the crew for a bit of filming. I often say that life is drab without cake and if you want to bring in fun, love and happiness into your life, you must make cake, eat cake and most importantly feed cake. If you are in the arena, looking for a good fruit cake this Christmas, you must give this cake a try. It will be sure to delight, please and appeal to all of your being! 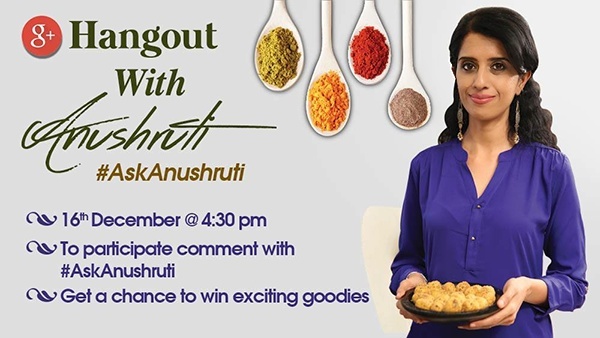 And in other news, if you have been following my website or my digital show Divine Taste With Anushruti and have questions for me, I’m happy to announce a google hangout on 16th December 2015. Do find the details in the sneak preview to the hangout, below. Also, log onto Rajshri Food Facebook page to stay updated about the hangout. See you soon! And I leave you with a piece of this cake! Lightly grease the base of a bundt pan and dust it with plain flour and tap to remove excess. Alternatively use two 8” or 9” round pan. In a large bowl, assemble the dry ingredients- the flour, baking powder and baking soda and sieve together to make the mixture uniform and prevent lumps in the flour mixture. In another bowl or the bowl of a stand mixer, put in the hot water and white and brown sugar and blend until the sugar partly melts. Quickly stir in the oil and the yogurt and mix well. Stir in the the dry ingredients into the wet ingredients, add the vanilla extract, cinnamon and nutmeg powder and mix well until you get a smooth batter, about 3 to 4 minutes. 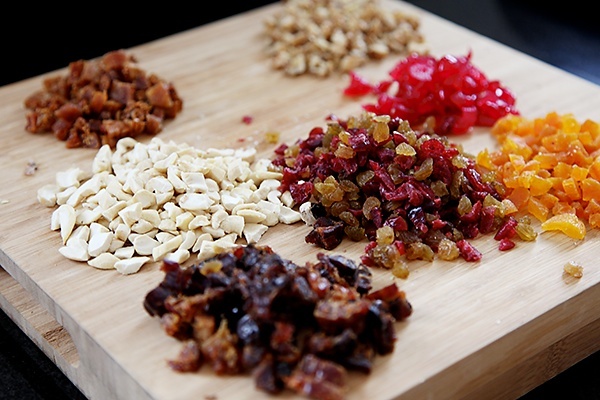 Stir in the dried fruits and nuts and mix again. Lastly, put in the remaining hot water and mix again. Bake in the middle rack of an oven. After 15 minutes lower the heat to 150C/300F and bake for 60 to 65 minutes more or until a skewer comes out clean. Allow the cake to cool for about 10 minutes in the pan and then transfer it onto a cooling rack. Allow to cool completely. Makes one large bundt cake or two 8” or 9” round cakes. Mix all the ingredients together and spoon over the cake. 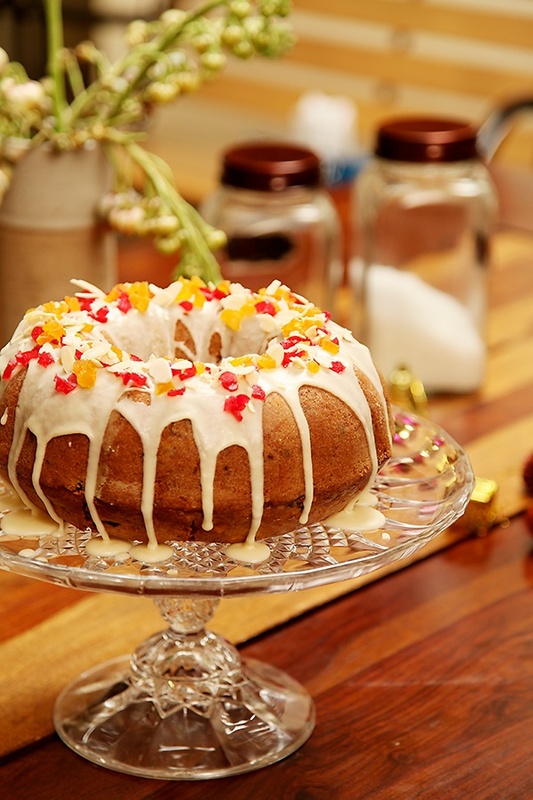 Decorate with dried fruits over the glaze. 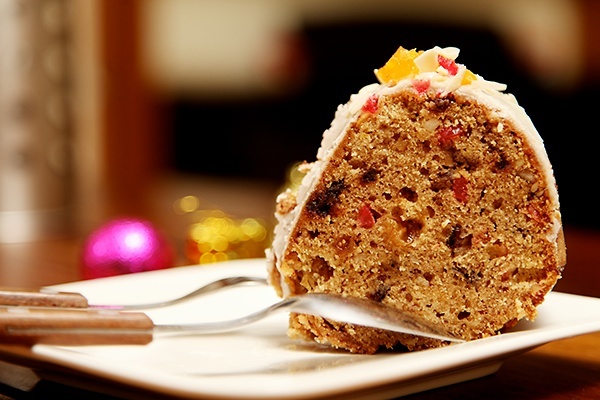 Fantastic Eggless Christmas Cake recipe. 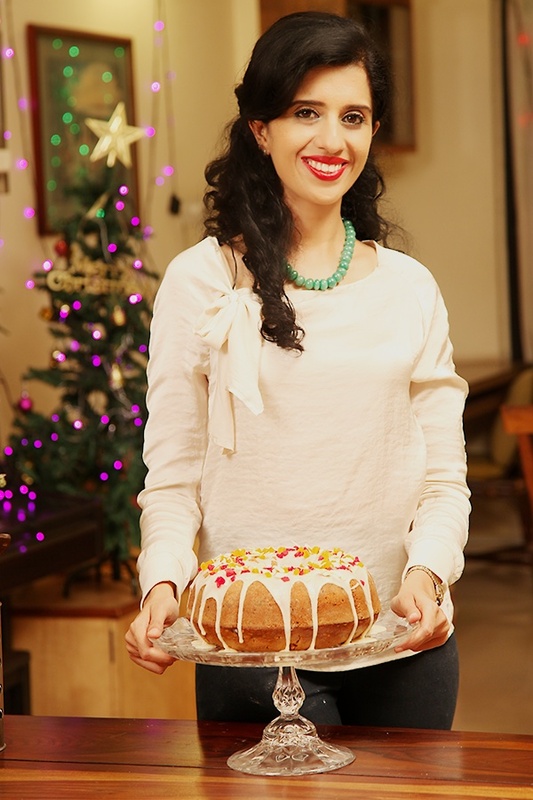 I always love to make cakes which are eggless and liquor free for Christmas. And this recipe is a perfect delight. Thanks for the same. Wow Anushruti looks very delicious and tempting recipe. Will have to try this Christmas. Lovely pics..lovely cake..beautifully captures the colourful spirit of Christmas. Thanks for the lovely recipe. Anushruti I am a big fan of your fruit cake recipe, how is this cake different from the previous one, : one in terms of taste and texture. Himani- How awesome is that! So pleased to hear this. 🙂 Please follow the recipe correctly for good results. Suzane-Thank you. Hope you like it. Sunitha- You are welcome. Glad you like it. Anita- You have to add the brown sugar along with the white sugar. The water is divided as 1 tbsp water is added towards the end, hope this helps and hope you will love this cake! Saranya- Nice to know that. Both cakes are similar in terms of taste and texture. This cake is easier and quicker and also has great form and texture in my opinion. Reva- Yes you can substitute whole wheat flour with plain flour. The cake will be more denser and maybe a bit crumbly. You can substitute equal parts whole wheat flour with the plain flour. I want to use only 250 gm of flour, so what will be the measurements for the rest. Dear Anushruti, I am some one who is completely technology un savvy. 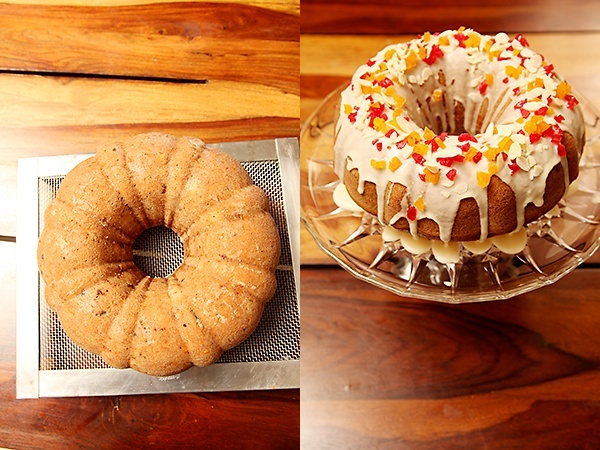 HOWEVER u website caught my eye n I fall short of words to appreciate u n ur receipes.A beginner in baking but an established cook I love to browse through all ur receipes n try them.Wish I cud have been enterprising like u.I wud like to try this cake but I don't have a bundt oan but I do have spring pan n a cake tin.But the OTG can't fit in the two pans together as u have suggested. How do I go abt it? Pls reply soon.Thank u so much for being who u r.
Lavanya- If you halve the flour, halve the rest of the ingredients as well. amna- Thank you so much for your kind words. You can halve the recipe and try it in your cake pan. Or bake it twice. Happy cooking and baking! Reva- Great! Do share the picture. I will share it on the divinetaste facebook page. I saw the video of this cake and i am very curious to know which brand of vanilla extract did u use. It seems to be non alcoholic. Ashima- I used sprig, it is non alcoholic. Fantastic, came out so good. liked very much by family and friends. Can I use whole wheat flour next time for this recipe? Please advise. And please post more recipes with whole wheat flour if possible. Thanks a lot for all these lovely recipes and never miss a single episode on Rajashree. Keep it up. Jigna- Great to hear that! You can try it with whole wheat flour but the cake would be a little crumbly. Will sure post more whole wheat cake recipes. Stay tuned! I just wanted to know whether this cake is moist or hard? 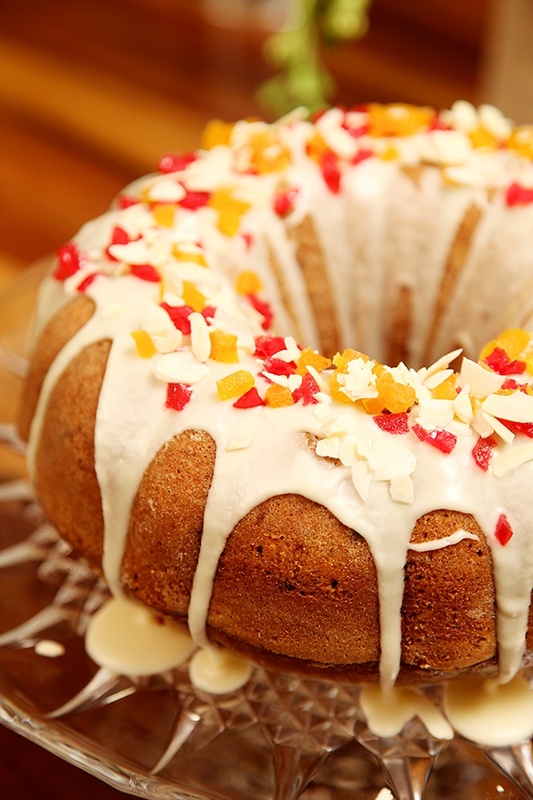 What to do to make moist cake? Lerina- Please follow the recipe and you will get a moist cake. All the cake recipes featured on this site are not hard cake recipes, if one follow's the instructions properly. 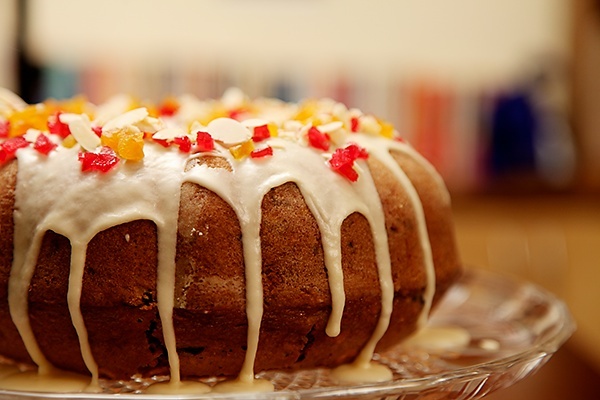 Today I saw your video on how to make a fruit cake and I just loved it. Nice recipe and very easy to understand. I want to bake it for my family. Just wanted to know what size of bundt pan you used while baking this cake. I am currently staying in US and here I saw bundt pans in 2 different sizes. And as I have a convection oven here how much baking time will be required to bake the cake. Is it different than one you have mentioned in the video or above recipe? Paps- I used the large bundt pan. If you are baking in a convection oven, then you need to reduce the temperature by 25C and reduce the baking time by 5 to 10 minutes. Christmas is just few days away. 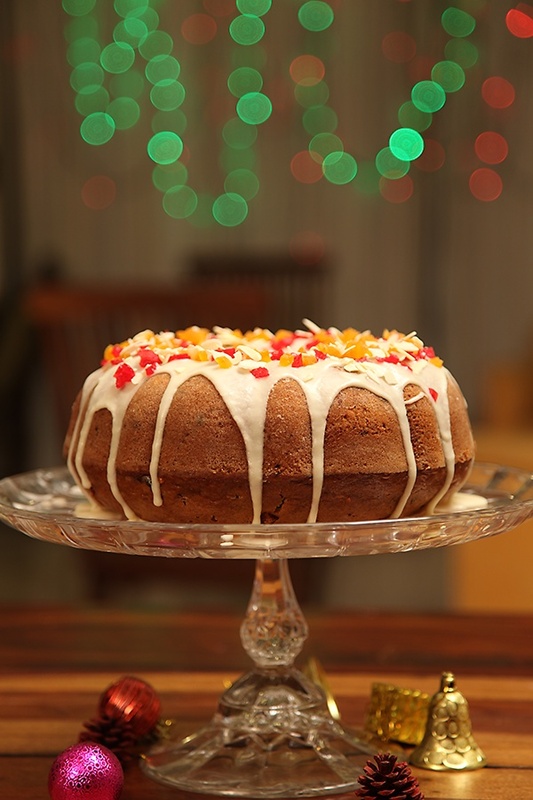 I wanted to make eggless fruit cake and saw your video yesterday and I found the perfect recipe. Thank you so much for sharing this recipe. Just wanted to know how many days I can store this cake. Nidhi- You can store this cake for upto a week in the refrigerator. Hello Anushruti, This cake was the highlight of my Christmas celebrations this year. The cake was relished by all of my friends and it was finished within no time. Each and everyone who had this was extremely impressed and the complete credit goes to you. Thank you so much for sharing this amazing recipe. I've been trying so many recipes from your blog and none of them have ever failed me till now. This site has become my favourite and I've actually started baking more and more ever since I stumbled on this site. You are my food inspiration. Thank you so much for inspiring me to cook and bake. Once again, Thank you so much for posting such lovely recipes. Sonal: I don't know what you mean by a regular cake tin. You could use only brown sugar though. Manju: Awesome! Thanks for the wishes. I had been looking for a good fruit and nut cake recipe and was thrilled to come across this recipe. I am going to bake a slab cake and two nine inch cakes for a special occasion Its an excellent recipe and am sure its going to be liked by everyone. Would like to know if you put more nuts and fruits than the quantity given in the recipe as it seemed as if you put more than suggested. Thanks for the excellent recipes. Your fan/admirer in Canada. Keep up the good work. Can I add all brown sugar instead of half white and half brown? As I would like to get a better colour for the cake. Also, is it ok if I reduce the qty of sugar as I find 500 gms of sugar for 500 gms of flour a bit too sweet for me? You can bake at the same temperature for about 30 minutes. Hi Anushruti, I will be baking this cake on Saturday. I have a convection oven and can only bake 1 cake at a time. So can I make the recipe with original quantity of ingredients and bake it one half at a time? Is it ok if the batter sits on the counter for about an hour while the first cake bakes? If not, how do you recommend I do it? Yes, you can keep the extra batter on the counter and bake again. No problem at all.